Pasqually, Saint-Martin and Willermoz are names which are revered in continental European Freemasonry, yet are scarcely known in England or the United States. Nevertheless, their influence has spread far beyond the borders of France, and what they established has affected Freemasonry – and other Orders – ever since. 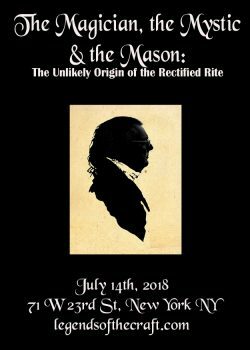 In this talk, you will learn how an almost chance encounter between these three men in the latter part of the 18th Century led to the creation of one of the most astonishing Orders in Freemasonry, one which still exists and which is considered one of the highest honors to be invited to join. Yet few of its members really understand the gnostic, theurgic and symbolic underpinnings of an Order which, had the French Revolution not taken place, was set to become the standard work across Europe for the following Centuries. Had this Order become the basis of Freemasonry, there would have been no doubt that the Fraternity would have indeed been based upon deeply spiritual and magical practices, and would indeed have been full of ‘secrets’!